Into that mid century, Madmen style? Check out this second floor condo just minutes to Uptown Charlotte less than of a mile to I-277 Uptown Outer Loop. Queens Station complex is nested in the tree-lined streets of historic Myers Park. Walk/jog from the Metropolitan on Little Sugar Creek Greenway, stroll the CPCC Uptown campus, or enjoy numerous dining options all within walking distance. 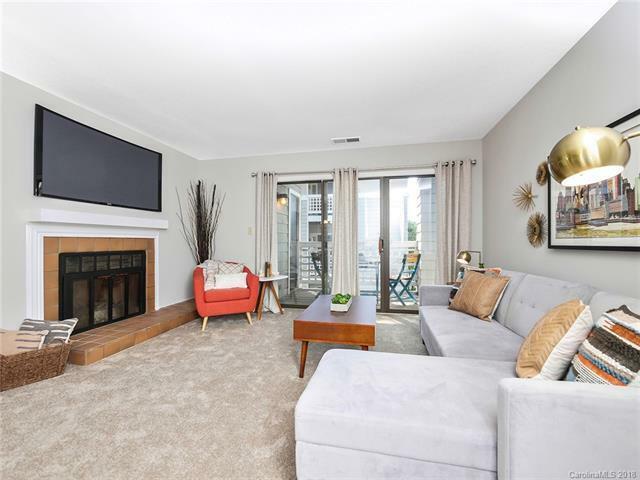 This condos interior has been updated with fresh neutral paint, new carpet, & updated light fixtures. The cozy one-bedroom unit has a spacious living room, dining space open to kitchen, & an efficient galley kitchen layout. Large bedroom suite has walk-in closet & extended length bath vanity. Private deck is great spot for enjoying crisp Carolina fall evenings. Very short walk to community pool. One designated parking space & plenty of visitor space within the complex. Dont miss this chance to own a piece of historic Myers Park!